Our Malcolm is ten today! It boggles the mind! How did it happen? Where did the years go? *sniff* Of course I’m thinking a lot about the day that he was born, and the overwhelming joy of meeting him for the first time, with all its fear and exhaustion and hope and bewildering amounts of love. But I keep thinking back to a day a few years ago. He’d had a bad cough. I took him to the doctor to get it checked out. He hates the doctor! It’s one of the few things in life he’s afraid of. Well, the doctor said we should go to the hospital and get an X-ray. Horror! He was so anxious and reluctant. But we went, and he was calm, even cheerful when we got there. I was worried about him, I was trying to keep his younger brother happy. We were waiting and waiting. And then they brought us to see the X-ray. I was undone! He’d taken a breath, and held it for the picture, and you could see the air in his lungs. It was so beautiful! His small bones were so delicate and strong, and so gracefully formed. I nearly cried! It’s moments like that, and births, and birthdays, too, that hit you over the head with a wollop of all of the love you feel for someone that you see every day, feed every day, scold every day, clean up after every day. Our Malcolm is a bright, funny, sweet boy. He’s full-speed-ahead-on-to-the-next-thing. He’s a pack rat and an inventor. He tells wonderful stories about things he’ll make some day. He’s fearless in the ocean. He’s thoughtful and comforting when you’re anxious. He’ll teach you everything he knows. He makes me angrier than anyone I’ve ever met, and then mocks me in my anger. He doesn’t stay angry long, and will hug you and go right on with his schemes and plans in a moment. He breaks everything he touches, but he’s clever enough to put it back together again. He could swim in a puddle. He claims to be an outside-water-creature. He claims to be part dog, and he says he can hear dolphins when he’s underwater. He’s always up for a walk, and he’ll talk your ear off while you walk, as if his voice moves his feet, and he’ll say the sweetest funniest things. He never listens!! But he hears everything. You can’t get a thing by him. He’s savvy, he’s sassy. He’s wise. He’s decisive, and good at giving advice. I’m so happy to know him, so excited to see what he’ll do with all his energy and creativity and strength, as he gets older. I was walking with him the other day, thinking about how much fun he is to have around, and I realized how lucky I am to have him as a friend. He wanted a tree cake with monkeys on it. He wanted the tree to stand up like a real tree, in three glorious dimensions. I was up for the challenge. We came up with a fiendish plan. We improvised as we went along, changing the scheme when we got to the candy aisle at the grocery store. And look at what we made! Martha Stewart eat your heart out! Doesn’t she wish she could make a giant messy lopsided tree cake? Doesn’t everyone! The trunk is made of brownies, and the two layers are held together with nutella. The cake itself is a chocolate chip cake. The frosting is a sort of buttercream. (That’s sugar and butter, people! That’s sweet!) 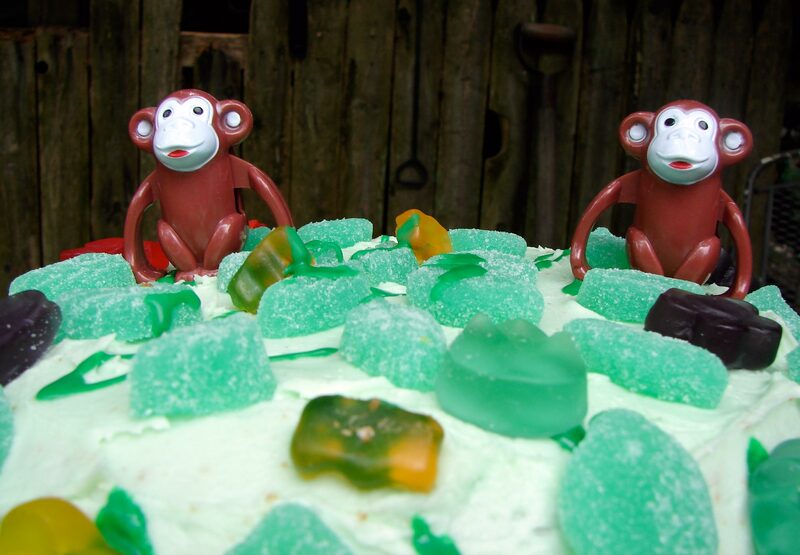 We couldn’t find gummy monkeys, but we used spearmint leaves sliced in half, gummy flowers, a few gummy bears, and two little wind-up toy monkeys. It’s a mess, but I like it!! Here’s my philosophy about birthday cakes…I’m not the neatest decorator on the planet, but if you cover something with candy, it appeals. If you basically have a few giant chip cookies poised on top of brownies, you’re golden!! Here’s July Tree, by Nina Simone. We’ve always thought it was about Malcolm being born! Cream the butter till soft and fluffy. Beat in the sugars, then the vanilla, then the eggs one at a time. Add all of the dry ingredients, and mix well. Beat in the milk. You should have a soft and fluffy batter. Stir in the chocolate chips. Butter a cake pan and two pie plates. Put a small square of foil in the bottom of each one. Butter over it, and then lightly dust everything with flour. Spread the batter in to the pans. Bake till brown on top, and it springs back when you touch it lightly. About 40 minutes, for me. Let cool completely. Melt the butter in a small saucepan. Transfer to a bowl and beat in the vanilla, the sugar, and the eggs. Beat in all of the dry ingredients. Spread into a brownie pan about 6 X !2 inches, and bake along with the cakes, until it’s firm when you touch it. Take it out and leave it to cool. Cut the brownies in half. Spread nutella on the bottom half, and put the other half on top. Cut the corners off to make it roundish, but don’t make it too small. Cream the butter. Add the sugar and mix it in as well as you can. Add the vanilla and milk, and whisk the frosting until it’s nice and smooth – this takes a while and a bit of muscle. Add more sugar or more milk to get the thickness you like. We put a touch of green food-coloring in. Spread frosting on the top of the trunk. Put one pie-plate cake on top, right side up. Spread frosting on that, and put the cake-pan-cake on it. Spread frosting on that, and put the last pie-plate-cake upside down. Frost all of the cakes a light green. 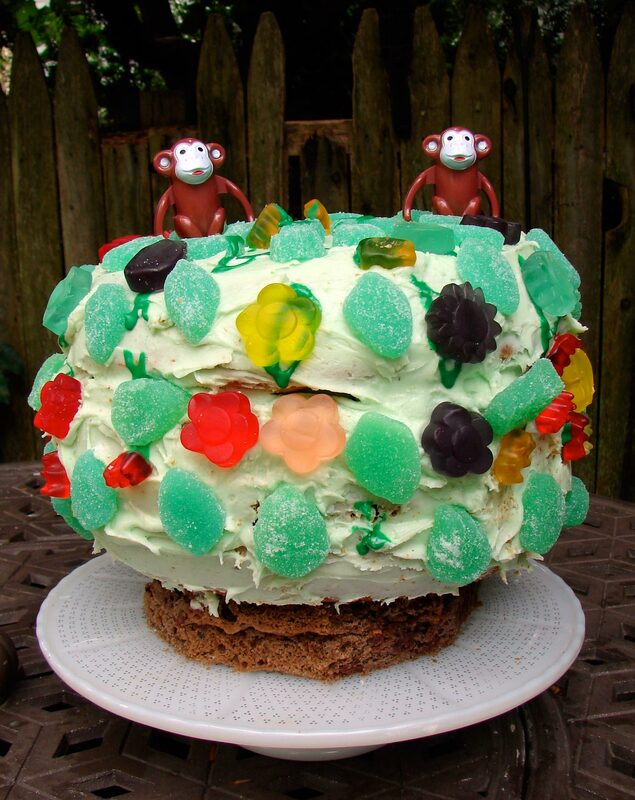 Arrange mint leaves all over the frosting, and place flowers, or gummi bears, or whatever decorations you like, artfully among them. Cut the mint leaves in half, lengthwise, keeping your knife parallel to the top of the leaf, so it doesn’t stick out of the cake so much. I used two packets of mint leaves. This entry was posted in cake, chocolate, dessert, Uncategorized and tagged brownies, buttercream frosting, chocolate chip cake, monkeys in a tree cake, nutella, tree cake by Claire. Bookmark the permalink. Clair: My hospital will make a DVD for $5 with all your XRays on it, I got one some years back. See if yours does it, it would be a nice addition to the family photo album…..T.
Hello, GF! Nice to see your name again!! It’s been a few years, I wonder if they still have the Xray. I’m not sure I could handle having it around all the time! Lovely post, though I feel a bit hyperglycaemic from reading it, it looks an utterly fantastic cake and very moving to read the post, topped off with a beautiful song ! I hope you can earn a living from writing sometime. Thank you, DaddyPig. I hope so too! And the cake was very sweet. I’m not a fan of frosting, generally, but it’s fun to play with sometimes! Hey! Malcolm and I have the same birthday, how cool is that! I didn’t actually have a cake, so do you think you could ask Malcolm if I could have a virtual slice of his lovely tree cake if there is any left? Happy birthday, Spotted Richard! That’s very cool, indeed. There’s so much real cake leftover, I wish I could send you some! I’ll raise a virtual glass to you as well. Thank you, I’d love some monkey tree cake. It looks so delicious. Just put it in a ziploc and force it down the modem link 😉 I’ll raise a glass of something fruity and non-alcoholic to Malcolm and me.